to those in uniform regardless of ranks. while freedom rings our flag still flies. *Thank you to Greg Yakubick, Lance Cpl., U.S. Marine Corps, for sending the prayer. If you are unable to view the video above, you can view it here. to sponsor a wreath for a fallen soldier’s grave during the holiday season! Memorial Day may herald the start of summer vacations for many, but donations are already being accepted for the 2013 Wreaths Across America Remembrance Ceremony, which is scheduled for December 14th, 2013. “Our mission: Remember, Honor, Teach, is carried out in part by coordinating wreath laying ceremonies a specified Saturday in December at Arlington, as well as veterans’ cemeteries and other locations in all 50 states and beyond. 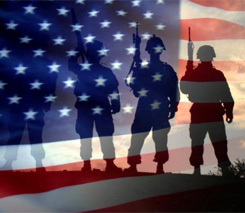 We also organize a week of events including international veteran’s tributes, ceremonies at State Houses and a week-long “Veteran’s Parade” between Maine and Virginia where we stop along the way to spread our message about the importance of remembering our fallen heroes, honoring those who serve, and teaching our children about the sacrifices made by veterans and their families to preserve our freedoms. 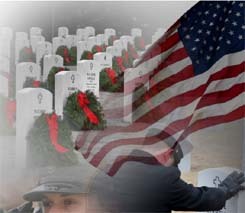 If you would like to sponsor wreaths to be placed on the graves of our military this December, now is the time! To donate and to learn how you can take part in this wonderful organization, click here. ← It’s Steeler Nation, Italian Style!